The interrelationship between wild animal, domestic animals and human health is appreciated now more than ever before. This is because of the recognition of the involvement of wild animals in diseases of humans and domestic animals, the impact of disease on wildlife management and conservation biology, recognition of new forms of environmental contamination, and academic interest in disease as an ecological factor. This is the first introductory level book about disease in wild animals that deals with basic subjects such as the nature of disease, what causes disease, how disease is described and measured, how diseases spread and persist and the effects of disease on individual animals and populations. 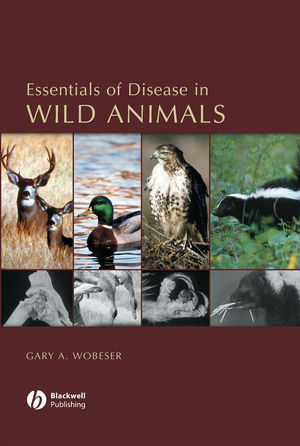 In contrast to authors of many other veterinary books, Gary A. Wobeser takes a more general approach to health in wild animals, recognizing that disease is one ecological factor among many and that disease can never be considered satisfactorily in isolation. Rather than focus on individual causative agents and their effect on the individual animal, the emphasis is on why disease occurred, and on the complex interactions that occur among disease agents, the environment and host populations. Written by a leading researcher in wildlife diseases, this book will fill a knowledge gap for those called to work with disease in wild animals who lack experience or training in the general features of disease as they relate to wild animals. Veterinarians, ecologists, wildlife biologists, population biologists and public health workers will find this book invaluable. Gary A. Wobeser, DVM, PhD is a professor in the Department of Veterinary Pathology, Western College of Veterinary Medicine, University of Saskatchewan. Chapter 2: What Is Disease?. Chapter 3: What Causes Disease?. Chapter 4: How Disease Is Detected, Described and Measured. Chapter 5: Damage, Pathogenicity and Virulence. Chapter 6: Defense, Resistance and Repair. Chapter 8: Transmission and Perpetuation of Infectious Disease. Chapter 9: Noninfectious Disease: Nutrients and Toxicants. Chapter 10: Effects of Disease on the Individual Animal. Chapter 11: Effects of Disease on Populations of Animals. Chapter 12: Diseases Shared with Humans and Domestic Animals.